Eastmarch is the eastern hold of Skyrim, and one of the four known collectively as the Old Holds. As its name suggests, it lies against the province's eastern border, close to the Dunmeth Pass, the only passage to and from Morrowind in the area due to the high and rugged Velothi Mountains. Windhelm is the only sizable city in the otherwise rural province due to the expansive hot springs which dominate the hold. 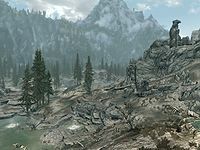 Darkwater River winds north from Lake Geir into this treacherous hot spot, where it meets the White River which then drains into the Sea of Ghosts as it passes Windhelm. River Yorgrim also joins with the White River before it ends at the Sea of Ghosts. It drains Lake Yorgrim, which lies west in the hold known as the Pale. 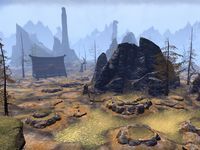 Nord tales say the hot springs of the region resulted from an intense battle between the hero Wuunding and a mighty Daedra.